This section will allow me to do write ups on the various items of interest you guys stumble on during the game. Helps both you and i keep track of things. Sunset is an ancient bronze Khopesh of unknown origin. Sages have likened the runes etched into the blade to some of the old orc desert tribes but that is just a theory. Regardless of its history Sunset is a wonderful blade and has had many owners. In a skillful hand it can be a versatile and deadly weapon. When Sunset is thrown it will teleport back to the bound owners hand once hears its owners verbal command. The teleport happens at the begging of the owners next turn as though it was quick drawn. Sunset must be able to "hear" the command word to before it will teleport back to is owner. When Sunset returns to its bound owner there is a bright flash of lights at both points. Upon hearing the verbal command Sunset will bathe the local area in dull golden sun light. Radius 3m around the weapon. For a person to bind them self to Sunshine they must meditate from sun up to sun down with the blade. The meditation cannot be broken or it must be started again.The meditation must be performed in full natural sunlight for the entire time. Once a person is bound to Sunshine it will respond to their commands. Only one person can be bound to Sunshine at a time. Sunshine was taken from the nameless dead mercenary by Aizen at the defense of the merchant caravan. NOTE: Aizen sold this during the night market at Rivering circa August 742DS. "A time may come where i could be of assistance. Just hold on tight to this and think of me!" "The last remnant of Guzwulaa, King of the 34 rat tribes. May his soul effortlessly transcend the great sky maze to the heavens above"
Acuity: The wearer gets a +2 to all hearing and taste/smell rolls and on skills that rely on thoses senses. Brotherhood: No rat, ordinary or otherwise will attack the wearer unless harmed by him first. Resiliance: The user recieves a +3 to all HT rolls against disease or poison. "An Orichalcum bladed great sword forged by Engord, master weapon-smith to the Fire Kings court." Blade Quality:indestructible for breakage purposes, except vs. another artifact. Then it merely gets the usual -2 to breakage. Blood for Blood: The wielder can, on rolling enough damage to defeat his enemy’s DR, opt to shed blood to worsen his victim’s wound – a perverse variety of “reverse vampirism.” The GM should tell the player that he has penetrated DR, whereupon the player must decide immediately whether to invoke this function for that hit. Each HP the user sacrifices increases penetrating damage, after subtracting DR but before applying wounding modifiers, by a point. For instance, a cutting neck blow that put 10 points of damage past DR would normally inflict 20 HP of injury, but if the swordsman sacrificed 5 HP, penetrating damage would become 15 points and so the wound would be 30 HP. This effect works for and on anyone with HP, regardless of whether he actually has blood. 3 – The blow does triple damage. If this wound results in a HT roll to avoid death, the victim rolls at -3. 4, 5 – The blow does double damage. Any HT roll to avoid death is at -2. 6, 7 – The blow does maximum normal damage. Any HT roll to avoid death is at -1. 8, 9 – Normal damage, but if this injures the target, then on the wielder’s next turn (only), that victim suffers the injury inflicted by the original blow again, as his wound putrefies. Enemies with any of Immunity to Metabolic Hazards or Injury Tolerance (Homogenous or Diffuse) are immune to this cyclic injury. 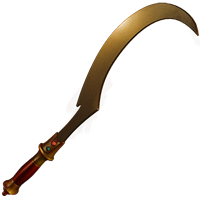 10, 11 – If attacking a limb or an extremity and any damage penetrates DR, the target body part is crippled. If the injury would cripple even without this effect, the body part is severed. Otherwise, normal damage only. 12, 13 – As 8, 9. 14, 15 – As 6, 7. 16, 17 – As 4, 5. "The Orichalcum Spring Gun – Orriginally created by the dwarfs of Faraway the spring gun is a “crossbow” that replaces the clumsy bow with orichalcum springs. Other innovations are a preloaded cylinder and a clever trigger, which greatly improve rate of fire." into the Gun’s body (this is 6 lbs. empty, 13 lbs. loaded), which contains trigger, gears, and arrow guide. Loading the cylinder into the body takes just four seconds. Thus, by swapping in ready cylinders, the shooter can attain an incredible reload time of half a second per shot. Once the Gun is loaded, each pull of the trigger releases one spring, shooting its bolt. It also lets the cylinder revolve so that the next bolt is ready to shoot. This enables the operator to launch an amazing eight bolts in eight seconds! Use the Crossbow skill to hit. "May they bring you safely back to me, my love"
Apply an energy shield, DR 4, that is completely cumulative with other DR. Braces cab be worn over clothing or cloth armor. "Carved from the hollowed skull of a burrowing demon, this horn has brought fear to those who hear it for many an age." These tight iron cuffs can fit over the wrists of any humanoids with a size no greater then +1 sp. When placed on a helpless humanoid the they make the captive more docile and compliant. The prisoner never attempts to escape of its own volition and agrees to any reasonable request unless it makes a will roll at -4 effective level.